Scottish Rite and Masonry, in general, is dedicated to helping our youth afford higher education, and we realize that with the ever-rising costs of colleges and universities, applying for multiple scholarships is a necessity! Every year several scholarships become available for the youth of the Masonic community, and it is once again that time of year. Below, several different scholarships are listed that you, or a child or family member may be eligible for. Criteria for each scholarship is different, so be sure to read them carefully and apply before the deadline! Don’t forget to investigate your Masonic District or Lodge, as many local organizations have a scholarship of their own. 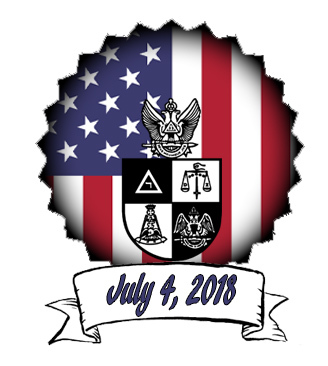 The officers and members of the Scottish Rite Valley of Salem wish you and your family a safe and happy Fourth of July! On June 21, the Massachusetts Council of Deliberation elected three members of Massachusetts Consistory to receive their Meritorious Service Awards. Brothers Robert G. Parsons, 32°, George K. Haile, 32°, and George H. Kopps, 32°, were all elected to receive the award. Brother Parsons is a member of the Valley of Lowell. Brother Haile is active in the Valley of Salem. Brother Kopps belongs to the Valley of the Merrimack. All three men are members of Massachusetts Consistory. The Meritorious Service Award is the highest award a Valley can bestow on a member and the Valley of Boston congratulates these Brethren on the recognition they have received for their hard work. We look forward to their continued work in the Fraternity in the years to come. Meritorious Service Award. In accepting the award, Brother Belanger said, "I want to thank all my brothers in Masonry for the support given to me, and have enjoyed working with all of you." 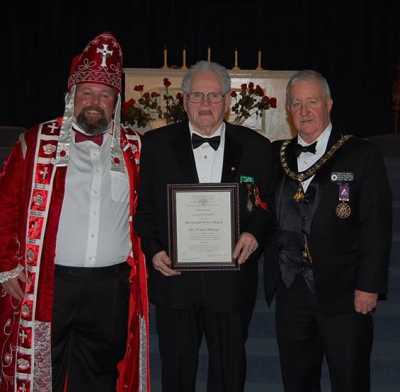 Pictured from left to right are Most Wise Master of the Emmanuel Chapter of Rose Croix, Jonathan Morley, John Belanger, MSA, and the Deputy for Massachusetts, Illustrious Donald Michael Moran. are invited to this special event featuring North Shore Acappella. Social Period with and Hors d’Oeuvres and great company starts at 5:30 p.m.
At 6:30 p.m. it's a Fried Shrimp Dinner, and then at 7:30 p.m. NORTH SHORE ACAPPELLA will entertain. The cost for this event is $25.00 per person. A Celebration of Doug's life. 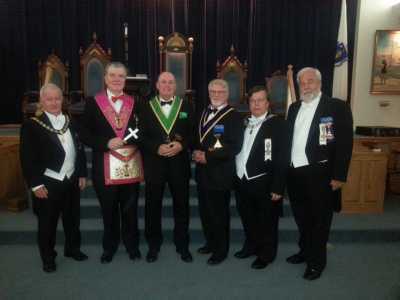 The new heads of the Valley of Salem with the Installing team at the Valley Installation of Officers, September 19, 2015. L-R: Ill.?.Donald M. Moran, Installing Officer – Deputy for Massachusetts, Bro. Mason W. Russell, Most Wise Master, Emmanuel Chapter of Rose Croix, Bro. Dana Lemieux, 32?, Sovereign Prince, Jubilee Council, Princes of Jerusalem, Ill.?.Judson W. Greene, 33?, Thrice Potent Master, Sutton Lodge of Perfection, Ill.?.John H. Day, Jr., 33?, Convening Officer and the newest Sovereign Grand Inspector General, 33?, Honorary Member of the Supreme Council, from the Valley of Salem, and the Master of Ceremonies, Ill.?. Mark C. LeBeau, 33?, Past Thrice Potent Master, Sutton Lodge of Perfection. 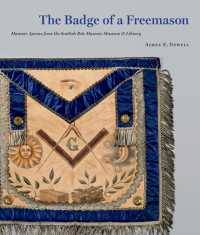 The Scottish Rite Masonic Museum & Library is pleased to announce that its new book, The Badge of a Freemason: Masonic Aprons from the Scottish Rite Masonic Museum & Library, is available. The book may be purchased online for $39.95 (plus shipping and tax, if applicable).The Scottish Rite Masonic Museum & Library is pleased to announce that its new book, The Badge of a Freemason: Masonic Aprons from the Scottish Rite Masonic Museum & Library, is available. The book may be purchased online for $39.95 (plus shipping and tax, if applicable). Plan to attend this special Family Life and ladies night offered by The Valley of Salem on Friday, June 12, 2015. It will be held at the Marblehead Masonic Building, 62 Pleasant St, Marblehead. Far too often, we in the fraternity learn and recite ritual without delving into the practical and existential applications of the very words we recite. Perhaps it would do us well to live the words as much as we recite them. While most Valleys in the Northern Masonic Jurisdiction do not wear the black cap of a 32° Mason, many do. Read more about this tradition. The Sutton Lodge of Perfection is requesting men to step forward to become officers of Perfection. There are currently have 3 vacancies which Ill. Judson Greene, would very much like to see filled by guys willing to put in the time and effort to learn new parts and become strong officers for Perfection. The Supreme Council announced this week that its official App is now available. Through the App, Masons will be able to receive push notifications from the Supreme Council and from the Councils of Deliberation. Other features include the ability to offer feedback and email; read about member services; request to join Scottish Rite; send a card to a Brother in need; read The Northern Light; learn about degrees and keep up with degree schedules; contact your Valley; obtain driving directions, and, for fun, to solve the Scottish Rite puzzle. Downloading is easy. For Apple products, go to the App Store; for Android, visit Google Play, and for Amazon, head to Amazon's app store. Join Aimee E. Newell, the Museum's Director of Collections and curator of the exhibition, to learn about the Scottish Rite's French roots, its founding in America two centuries ago and its evolution into one of the most popular American fraternal groups during the 1900s. The exhibition includes photos, costumes, and Scottish Rite props, many of which have never previously been on view. Free. Saturday, April 26, 2:00 p.m. The Massachusetts Consistory member jewel is unique among those presented within the Scottish Rite. It was custom-designed to represent the lessons learned and principles inculcated in Scottish Rite degrees. The jewel illustrates the strong link between Massachusetts Consistory and our Scottish Rite heritage. It also emulates our close ties to Blue Lodge Masonry and the Grand Lodge of Massachusetts. Read more to learn about the new Consistory jewel.